After the winter we’ve had, I think EVERYONE is excited to freshen up their home and wardrobe for spring, am I right? I feel like that’s especially so for me since I really didn’t shop for winter with the wedding and all the travel we did, and since the cozy gables house will be done in a couple of weeks. So, below is what I’m shopping for spring, most of which I’ve already purchased myself lol. 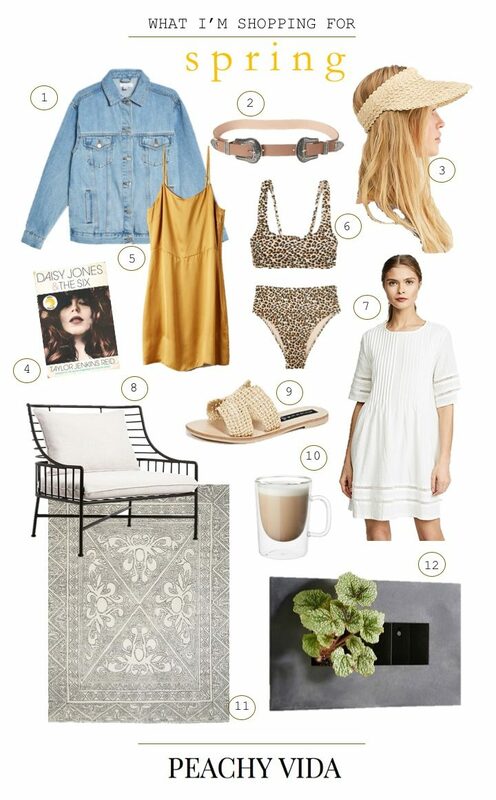 I’m most excited for the white easy work-or-play dress, a new oversized denim jacket that can be layered with anything and the animal print bikini that so many of you have asked about from my insta posts. I also have the leather version of those woven sandals and have worn them non-stop, and have looked for nice double-glass wall mugs for a while.